Yes, White people can be saved. In God's redemptive plan, that goes without saying. But what about the reality of white normativity? This idea and way of being in the world has been parasitically joined to Christianity, and this is the ground of many of our problems today. It is time to redouble the efforts of the church and its institutions to muster well-informed, gospel-based initiatives to fight racialized injustice and overcome the heresy of whiteness. Written by a world-class roster of scholars, Can “White” People Be Saved? develops language to describe the current realities of race and racism. It challenges evangelical Christianity in particular to think more critically and constructively about race, ethnicity, migration, and mission in relation to white supremacy. Historical and contemporary perspectives from Africa and the African diaspora prompt fresh theological and missiological questions about place and identity. Native American and Latinx experiences of colonialism, migration, and hybridity inspire theologies and practices of shalom. And Asian and Asian American experiences of ethnicity and class generate transnational resources for responding to the challenge of systemic injustice. With their call for practical resistance to the Western whiteness project, the perspectives in this volume can revitalize a vision of racial justice and peace in the body of Christ. "This tour de force challenges the destructive nature of racism that has torn down the very structures of our local and global societies in order to construct the edifices of colonial Christianity. Beginning with the discourse around white supremacy, the book argues that the colonial mentality has invaded many other forms of Christianity around the globe such as: European Christians and indigenous peoples of the Americans, caste and race in India, and Asian Americans and affirmative action. This is a topic which Christians today—especially evangelicals—can no longer ignore." "As I read through this book (a compilation of papers from an important academic conference) my first response was, Why couldn’t I have been there! For those of us who could not attend this dynamic and important gathering, we have the tremendous opportunity to interact with the significant findings from a meeting of some of the best scholars on this topic. The problem of race and its intersection with missiology continues to elude many in the American church. Told from multiple perspectives and voices arising from a myriad of experiences and expertise, this text will serve as a vital primer for those who seek a more profound understanding of race, theology, and mission." "This book brilliantly captures and elucidates one of the gravest and long-standing threats to Christianity: a theology fashioned in the idolatrous images of race, power, gender, ability, or nationalism. Zeroing in on whiteness as a concrete example of this kind of treacherous theology, the book teaches us how to smash such idols and let radical love, equality for all of God's children, and shared human dignity shine forth from our theologies and practices." "The emphatically Christian voices in this important book explore the damage done to Christian witness by the tight bond between Western missionary activity and unreflective racist assumptions. While some particularly helpful contributors record parallel difficulties arising in other cultures, all pose a biblically based challenge to the aggressive nationalism, manipulative colonialism, and unthinking Enlightenment assumptions that long tainted Western missions activity. It is a sobering and thought-provoking book." "In a growing corpus of work on antiracism, Can "White" People Be Saved? : Triangulating Race, Theology, and Mission stands out at many levels. To begin with, it overcomes the tendency to engage the topic of racism as a black and white binary. The book includes a variety of outstanding scholars from various ethnic and cultural backgrounds, including evangelical or evangélic@ perspectives such as Drs. Love Sechrest, Willie James Jennings, Andrea Smith, Elizabeth Conde-Frazier, and Amos Yong. Second, the book is distinctive from other books on antiracism in that it is profoundly theological, intentionally scriptural, and eminently praxeological. Third, given the recent climate of stridency and intolerance, it is refreshing to read a book that seeks not to demonize any one constituency but rather to bring fresh knowledge and understanding to key concepts (racism, white supremacy, whiteness, postcolonialism, etc.). It enables the reader to see how racism is above all a structural problem that impoverishes the church and the world it is called to serve. Finally, the book is unique in that its constructive dialogue about overcoming the deforming dis-ease of racism and white supremacy leads to a missiological paradigm shift, allowing missions to become truly life giving and Spirit filled. It is an important book that everyone who is committed to the biblical notions of justice and the reign of God should read and own." "In the series of essays found in Can "White" People Be Saved? an all-star lineup of Christian scholars thoroughly challenge many of the notions of nobility that have always accompanied modern mission and its racist entanglement with white supremacy. The issue is complex but not complicated. Seamlessly, the authors out the premise of current and past systemic racism enmeshed with Christian mission, and then disentangle the practices associated with whiteness and mission. 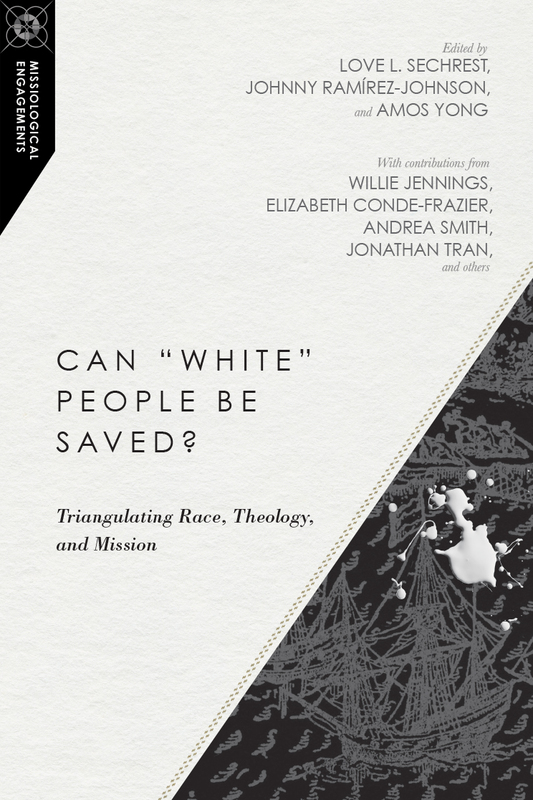 The exposure of whiteness as normal, embedded in modern mission, is competently examined and exposed in Can "White" People Be Saved? How the church responds will answer the question." "Can "White" People Be Saved? : Triangulating Race, Theology, and Mission is informed by a narrative historical timeline that traces and analyzes the study of race and racism. In an era where the relevance of church is increasingly called into question, this compilation of interdisciplinary essays is essential reading." "It is obvious from this volume's chapters that the past quarter decade of 'racial reconciliation miracles' in and among evangelical and Pentecostal denominations and movements were hopeful gestures. The authors lay down clear signposts for the rocky paths Christians have trod, for the troubled crossroads evangelicals inhabit, and for the way of straightening still to be done in search of a beloved community. Can "White" People Be Saved? challenges readers to undertake a difficult but ultimately rewarding journey of introspection." "Fuller's 2017 Missiology Lectures were for me an experience of a lifetime. I am thrilled that the talks presented are now available in one volume for a wider audience. The breadth, depth, and diversity of perspectives—from North America, Latin America, Asia, and Africa—and the interdisciplinary approach in tackling the complex issues around race, theology, and mission are highly commendable. The work not only diagnoses the evil of racism, with distortion of mission and damage to Christian witness, but also offers a positive vision of living out who God intended us to be—community in the Holy Spirit—by offering practical guidelines for deconstructing narratives of whiteness and blackness, racial superiority and inferiority. I am so thankful that part of the future is the end of modern mission as we have known it. "For those of us whose skin pigmentation has been labeled black, we shall be delighted that finally the question is asked bluntly, Can "White" People Be Saved? These essays demand, however (without stating it explicitly), that we ask the corollary, Can "Black" People Be Saved? Both whiteness and blackness are 'demons' that ought to be exorcised for us to embrace God's salvation because as the essays articulate, any racial categorization renders some people outside of the category of human. "I commend this volume in its entirety, not because it is infallible on matters of race and theology (for we know it is not) but because it models for us how as a people of God in this historical moment, in our diverse social locations, we may boldly confront, in love and with integrity, the distortions and deformations of the gospel inherent in the partiality and particularity of any location—historical, cultural, racial, or otherwise." "It is rare that a set of essays offers such consistently insightful theological material to help us grapple with Western ways of being and doing—ways that many take for granted but that many more have shown to be sinful and destructive. These ways have been shaped by deeply ingrained and implicit assumptions that place whiteness—both as phenotype and as culture—as normative in our thoughts and actions. These thoughtful essays will help us navigate a way forward with integrity, sensitivity, and empathy for all."